“But African civil society wants no part of this latest Monsanto aligned ‘public private partnership.’ Whatever will the progressives do now that their flawless hero has teamed up with their most hated nemesis to exploit an entire continent like they did to India not that long ago? Of course, that’s an outrageous lie. Private citizens have been building their own silos for centuries. But it’s true that only the biowreck engineers will foist patented seeds and toxic chemicals on Africa. “The soil is stripped of all nutrition and zombified by ever-increasing applications of synthetic fertilizer. Monoculture is ever more dependent on the increasing application of ever more toxic herbicides and pesticides. Deployment of GMOs escalates these vulnerabilities. Factory farms can exist only with ever increasing use of antibiotics. All these systems are extremely tenuous, vulnerable, not robust, not resilient. They’re all guaranteed to collapse. Hermetic monoculture, and industrial agriculture as such, is one big hothouse flower which requires perfect conditions to survive…. 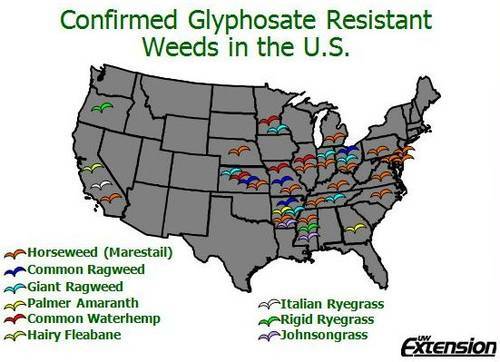 Over half of US states are now plagued by agrochemically-induced superweeds. An industry sponsored study of pesticide use predicts that by 2016, nearly a billion pounds of these toxic chemicals will be poured on US soils. The Bt toxin used to engineer cotton and corn also kills human kidney cells, reports Dr Eva Sirinathsinghji, and the drift from aerial application of Roundup prompted the Mississippi Rice Council to sound a national alarm over genetic damage to natural rice, calling for severely restricted aerial application. Huber’s warning to the USDA to halt GM crop approvals, and specifically, genetically modified alfalfa, was not only ignored, but two months ago, Ag Secretary Tom Vilsack hastened the approval process for genetically engineered crops. Let’s hope these “public/private partnerships” are met with firm resistance by African farmers, as supported by this Declaration from a group of African civil society organizations. The last thing Planet Earth and all its organisms need is more toxic industrial chemicals.